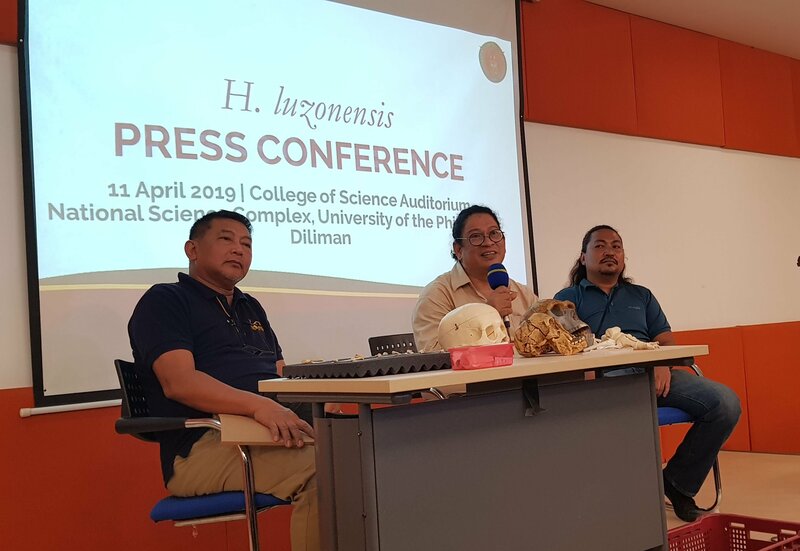 A press conference to announce the discovery of Homo luzonensis, a new human species, was held at the College of Science Auditorium in UP Diliman earlier today. Homo luzonensis is very small, said Dr. Armand Salvador Mijares who led the international multidisciplinary team behind the discovery. Its actual height cannot be determined from the current set of bones, explained the UP Archaeological Studies Program associate professor, but the extremely small fossil teeth found in the site reflect its very small stature. Since Luzon has always been separated from the rest of the continent and surrounded by water, how the ancient species reached the island puzzles many. For Mijares, its arrival was more likely deliberate rather than accidental, although this suggests the capability of Homo luzonensis to build sea-going vessels. Dr. Eusebio Dizon who works at the National Museum of the Philippines as an expert at prehistoric archaeology declared the discovery “their biggest find” that would impact not just on the Philippines but also on the world. According to Assistant Vice President for Academic Affairs Carla Dimalanta, the discovery stresses UP’s commitment to utilize public funds for research that creates significant new knowledge and with profound benefits to humankind. “We are excited to see how this will influence related fields and ways of looking at ourselves and the world,” she added. Two national museums and six universities from the Philippines, France and Australia worked together on the historic find. The press conference was organized by the UP Office of the Vice President for Public Affairs and CoST UP (Communicating Science and Technology Research and Development at the University of the Philippines). CoST UP is an initiative supported by the Office of the Vice President for Academic Affairs under the Emerging Interdisciplinary Research Program.